Attract and enjoy a variety of birds by offering seed or seed blends, 2 lb Seed Cylinders, No-melt Suet Dough Cylinders, Stackables, mealworms, peanuts, suet nuggets and/or fruit in this all-purpose feeder. You can also offer suet plugs in the specially designed holders. The large dome protects the food and birds from the weather, and it raises and lowers, allowing you to feed only the birds you want. Comes with a lifetime guarantee. Use this feeder to discover the diverse food preferences of your backyard birds. 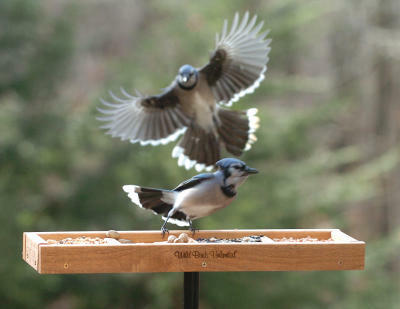 Designed to provide birds with more food choices, our Fundamentals Buffet Tray Feeder features four separate feeding stations and is a tidy dining solution when filled with No-Mess Blend, Suet Snacks™ or peanuts. This wooden feeder is sure to be one of the most visited feeders in your yard, and depending on your bird feeding setup, it's easy to hang, deck mount or pole mount. Different food will attract different birds. Our SideDish™ can offer a variety of foods, including mealworms, seed blends, fruit or our always popular Suet Snacks™. 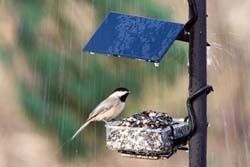 The Weather Guard protects birds from inclement weather and covers their food, keeping it nice and fresh. And thanks to our EZ-Attach™ design, adding this combo to your Advanced Pole System® (APS) setup is a snap. Just slip the EZ-Attach units on an extension pole and pull down.